A blog about agrarian ideals, interests and ideas. Thank you for logging on to the very first edition of the Lil Bitty Farm Blog. My name is Todd Frey and I live in southeastern PA. I am looking forward to sharing together with you about small scale agrarian ideals, interests, ideas and practices. I'd like to begin by telling you a little about myself and my "lil bitty farm". I am 57 years old and have been married to my wife, Marla, for 32 years. We have two boys, # 1 is married and lives close by. #2 is in the Marines and is preparing for his first deployment. Marla and I own 2 1/2 acres here in Chester County PA. At this time our lil bitty farm consists of a small barn still under construction, a fairly large garden, two apple trees and about 25 laying chickens. Most of what I will be blogging about will be my agrarian ventures here on our own 2 1/2 acres. I will be sharing with you what kinds of things I have been doing for a number of years, what I am currently doing, and my hopes for the future here at Lil Bitty Farm. 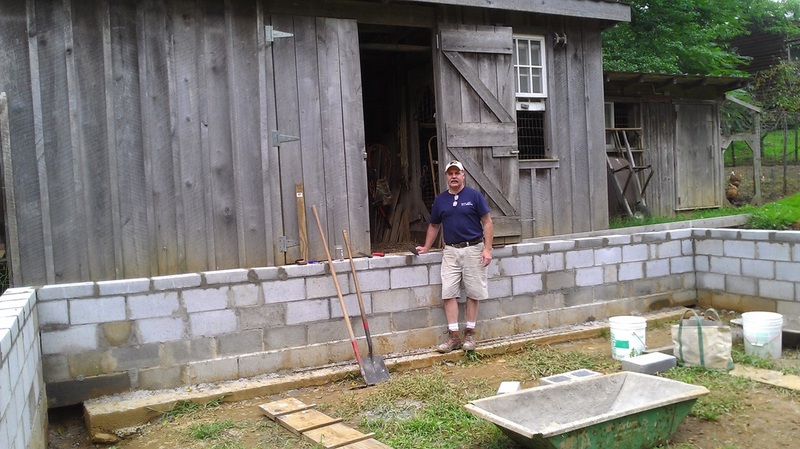 In Aug. of 2012 ( I say 2013 above because a majority of the work was done that year) I began construction of a small barn here on our property. The overall dimensions are 24' wide by 30' long. First we had to do a small amount of excavation work. A friend owns a small track loader and his son served as the operator. The excavation work was complete in about 2 hours. Next was digging footers and pouring concrete in these footers. This was done by another friend who owned a tractor with a backhoe and loader. Backhoe was used to dig the footer, loader was used to transport the concrete from the ready-mix truck to the footer ditch. This took the better part of a day. A few days later, after the concrete had properly dried, I began to lay the block. I'm not a block layer but I did it once before and have been involved in construction projects a good part of my adult life. August is not a great time to lay block but I started nonetheless. The block laying was done a little at a time, in my spare time, so I really don't remember how long it took me. 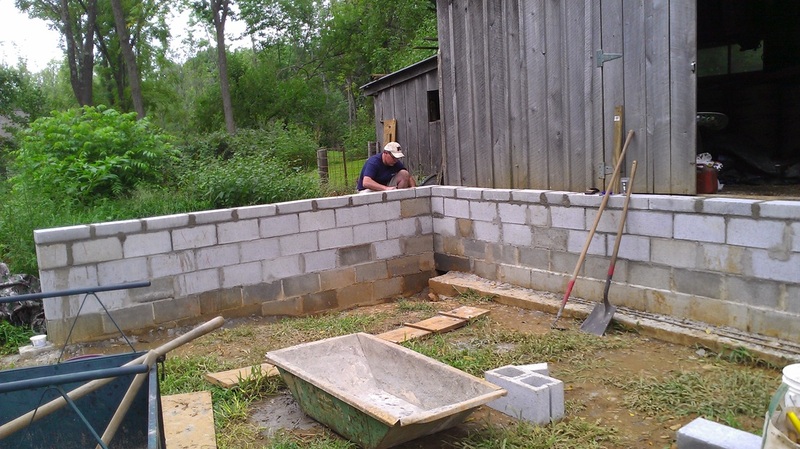 Although I was excited to be working on my long awaited barn I wasn't terribly excited to be doing concrete and block work. Those were only necessities that needed to be done so that I could get to the fun part - the wood part! Most of my adult life I have derived my livelihood from doing carpentry and woodworking/cabinetmaking so I was really looking forward to "the wood part". I will post more pictures of progress on the barn in the following posts. Obviously we are in the middle of winter here in southeast PA. A cold and snowy winter was predicted back in late fall by the weathermen and so far it seems to be on track with their prediction. Even though there is not near the activity as the other seasons, there is still some interesting things going on here at the homestead. 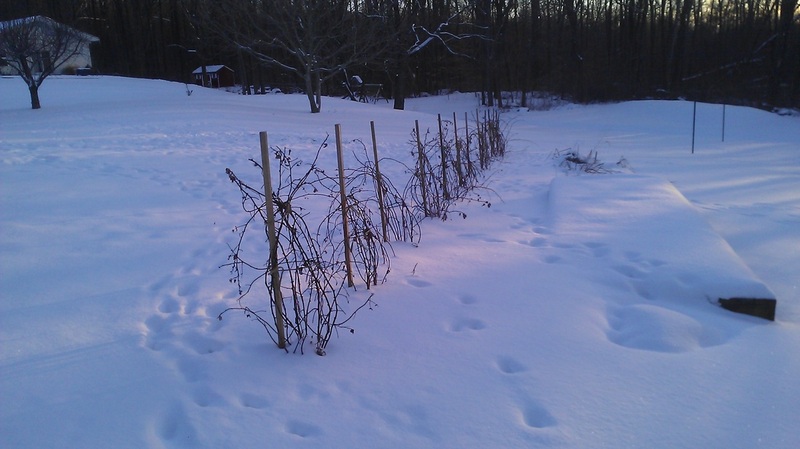 The garden lies quiet and dormant, intent on rejuvenating itself for the coming growing season. While most activity is curtailed by cold and snow there is still some comings and goings in the garden, but its all at night. The deer seem to be stopping by the garden at night to paw away the snow to reach the thick green carpet of winter rye planted underneath. I'm glad to oblige them during this time of year since there is not much to sustain them elsewhere. Another interesting winter past time is looking at animal tracks in the snow. I confess, I'm not very good at it but its fun to try and figure out. Just last night I spotted the tracks of the stray cat that lives under my woodshop. When I mentioned this to Marla she says, "oh, thats why we haven't had any mice in the house so far this winter". Even though I'm not a cat person I'm kind of hoping he/she moves into the barn when it is done to help control the rodent population there. 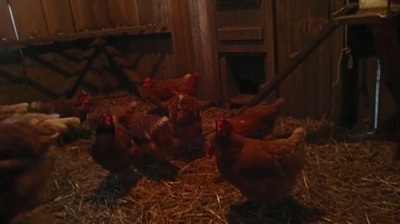 The chickens continue their daily routine of eating, drinking, scratching and laying eggs. They are little effected by the snow and cold as long as they are inside and protected from the wind. Curious little creatures they are. A few years ago I noticed that when I came to feed them, with snow on by boots, they would peck at that snow as I would move slowly about them doing my daily chores. I thought this unusual, seeing that when it snows they don't like to be outside in it. So, knowing they like to peck at the snow but not walk around in it I bring the snow to them. Every couple of days I take a shovel full of snow and put it in their coop for them to enjoy; sort of like me having a bowl of ice cream every once in awhile. This Christmas I received two Christmas gifts related to my agrarian activities and I didn't ask for either one. Interestingly they go together and neither giver of the gifts knew what the other was giving. Marla bought me a new pair of "Muck Boots" and my father-in-law made me a boot jack. In case you don't know what a boot jack is, it is a simple wooden device that enables you to take off your boots without bending over or getting your hands dirty. The front end has a good sized "V" in it and is raised up off the ground a couple inches. While standing on the back half of the jack with one foot, put the other boot in the "V" notch and pull your food out of the boot. Every back-yard farmer needs an easy-to-slip-in-and-out-of pair of muck boots and a boot jack! Your wife will love you for keeping the muck out of the house!! I know from experience! Thanks again for taking your valuable time to read this new blog. 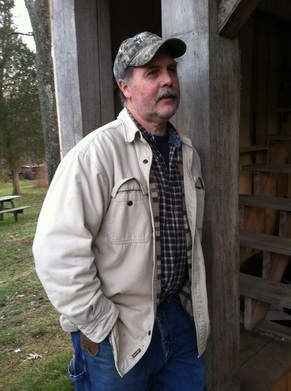 If you know of anyone that might enjoy this type of blog please tell them to tune in for more agrarian musings.